Podio is a loved tool in the REI community. Its flexibility and integration capabilities make it a powerful solution to automate your REI workflow. On this post, we're going to show you how our Power Tools can bring your REI workflow in Podio to the next level and recommend you the REI solution from one of our close partners: REIvolution. For those who are not yet familiar with our Power Tools, here's a 2 min intro video to bring you up to speed. If you want to stop losing deals deals from poor follow up, then keeping your leads up-to-date is essential. Bulk edit allows you to quickly edit the value for one field for multiple items. Select the leads that you want to update, and update their status with just a few clicks. By combining Bulk Edit and Globiflow workflows you can easily send e-mails in bulk to your leads or agents. Click here to learn more about this. You want to create an clear summary for your agents. You'd like to give them an overview of their scheduled appointments, including relevant information about the related leads and properties. 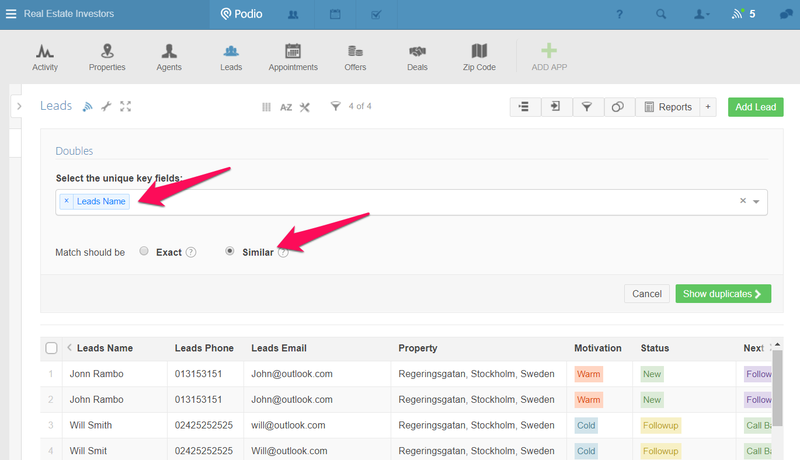 Collecting data from several Podio apps into one report can be quite cumbersome in Podio. You either have to build workflows to copy the values from related apps, or you have to create your desired report offline in excel. Power Export solves this problem! This tool allows you to combine fields from related apps in one export. 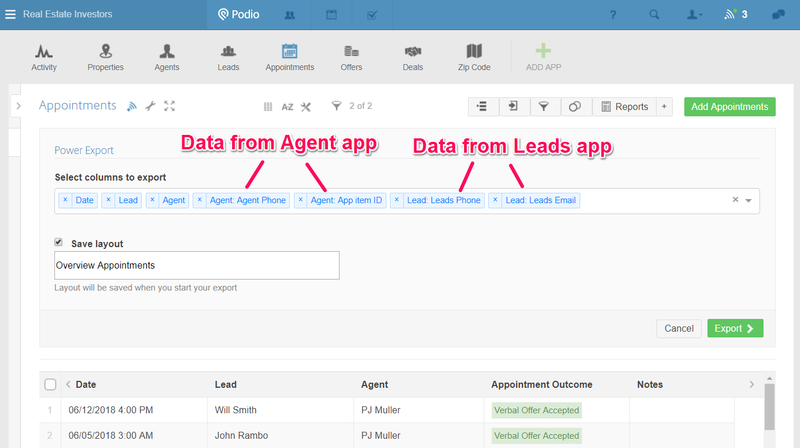 Simply build your desired lay-out once in the appointments app, and include fields from the leads and properties app. You can save your lay-out for future use. 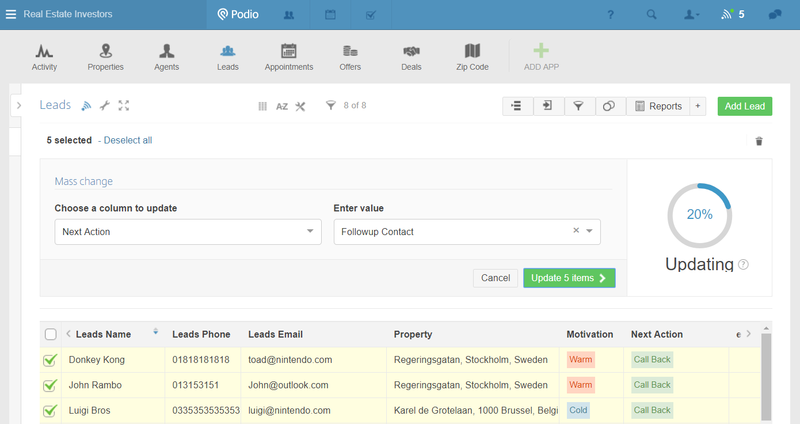 Imagine this: You have 3 Podio apps: Leads, Properties and Zip Codes. Every lead is linked to a property and every property is linked to a zip code. You would like to filter in the leads app on all leads that are linked to a property from a specific zip code. Power filters allow you to easily filter on data of related apps. In just a few clicks, you can set up a real-time sync of field values from related Podio apps (both outgoing and reversed relationship fields). You no longer need to configure any complex Globiflow workflows or add Java code in a Podio calculation field - all it takes is just a few clicks. Are you registering your leads via a webform? Then there's a good chance that there is duplicate data is being entered in your leads app. With doubles you can easily detect and remove duplicate records. If you want to get even more juice out of your Podio REI setup, we recommend trying out a free trial of our partners' dedicated REI platform at ">https://www.reivolution.io. REIvolution is the first all-in-one data-driven platform that enables real estate investors to scale their business. It is a unified system that does everything for you, empowering you to take smart decisions and scale your business. REIvolution’s mission is to help real estate investors automate their businesses to use data to their advantage, work and communicate more efficiently, become more profitable and win back their time.